The company positions this model as an entry-level universal notebook. Well, its universalilty comes from the "all-in-one" principle - you don't need any devices to take with it, and the entry level is determined by its characteristics and price. Note: the notebooks comes with desktop Pentium III processors which, on the one hand, simplifies modernization, but on the other hand, doesn't provide for the SpeedStep support. 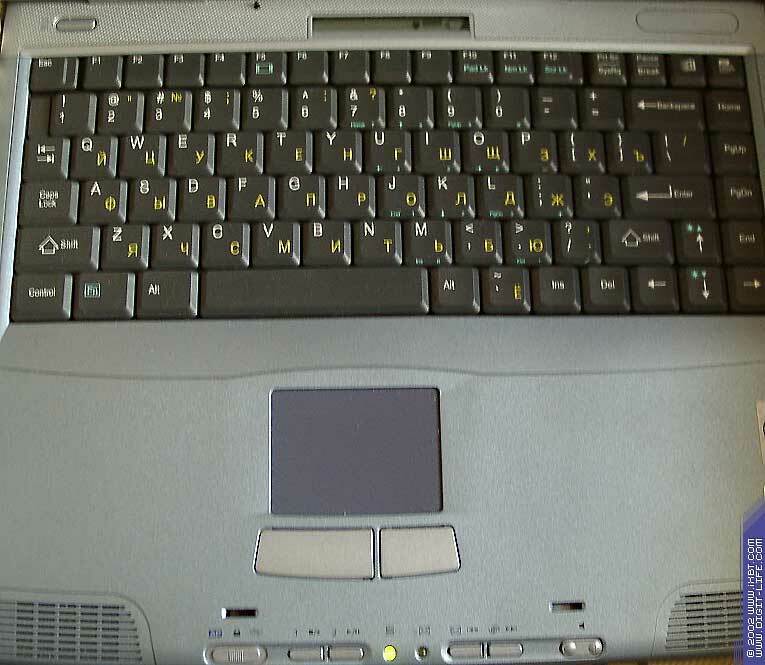 Wedge-shaped notebooks are typical of Fujitsu-Siemens, and at the same time the design of the notebook is standard for "all-in-one" systems - just compare with the Toshiba Satellite 1800-804. The prominent front part with control buttons of the CD/DVD player which can be pressed even if the notebook is folded up, makes it look flippant. Such design is meant mostly for youngsters. 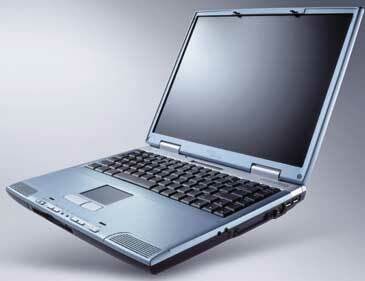 The floppy disc drive is located in front. The display is comprehensible, there are a lot of pictograms which help to understand the modes. The keyboard is simple, without much space next to the cursor buttons (like on the Toshiba model), but it is still convenient). The touchpad doesn't have scrolling keys - well, this is just an entry level. 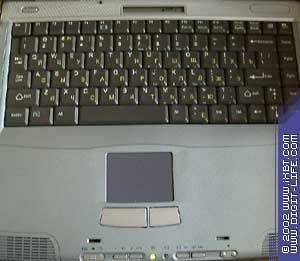 The hot keys for applications are combined with the CD/DVD player's control buttons. The modes can be switched with a 3-position slider. In the left position - "AP" - the buttons are used for quick startup of applications, in the central one the keys are locked up, only the volume control works, in the right position it's possible to control the player. Programs can be assigned with the Quick Touch application button utility. On the whole, it's easy to handle this machine. It's a bit inconvenient to have the drive in front (but it is only when you put the computer in your lap). Lack of the infrared port is not pleasant, but the entry level obviously implies that a buyer doesn't have a phone or a printer equipped with an IR port. The warranty period is 1 year. Unfortunately, the world-wide warranty is valid not in all countries. Apart from the description and specification of the notebook, and addresses of the service centers the European site offers drivers and BIOS updates. The documentation is available on the main site. No problems with the online support. Besides, since February 15 Fujitsu Siemens Computers renders the technical help via ICQ (!). You can add the memory, but you should do it in the service center until the end of the warranty period. "-1" - for the design of the front panel (subjective).
" -2" - the floppy drive is located in front. As it is possible to set three video memory sizes for this model, we carried out the tests for each of them. As you can see, for the business applications the video memory size is not important. On the contrary, multimedia applications require more RAM; and this is natural because there are applications in this suite which work, for example, with sound. The optimal size, in my opinion, is 8 MBytes if you don't work much with graphics, and 32 MBytes if you do. 16 MBytes is, as usual, an intermediate variant. Well, it's useless to expect high performance in 3D graphics from this model, that is why I will just show you the results of the 3DMark 2001 achieved with the 32 MBytes memory. You can compare it with the Asus S1 - the difference is noticeable. Well, this model is not what a gamer is dreaming of. Our mark - 95 scores. This is a simply good model, not more. Though I prefer a more conservative design. The concept "entry level" is quite vague - the processor's power and the drive's speed are sufficient, and the video subsystem works well with bussiness and multimedia applications. However, gamers won't be interested in it. The price, however, is quite acceptable (the test configuration costs some $1710, the modification with the Combo DVD+CD-RW is available at approximately $1840).